Private guided tour over Luxor on a hot air balloon. Explore the open-air museum of Luxor on this adventurous trip. Embark on this awesome day trip to Mahmya and create memories of a lifetime. Snorkel on the impressive coral heads scattered in the clear lagoon. Enjoy lunch with seafood and Italian specialties. Travelling to Egypt? Chat with a local travel specialist in Egypt who can help organize your trip. Cairo, one of the biggest cities in the Middle East, is a timeless metropolis settled on the iconic River Nile. Spending holidays in Cairo is the best way to experience Egypt’s rich and diverse history, which pulses at every step of its busy streets. 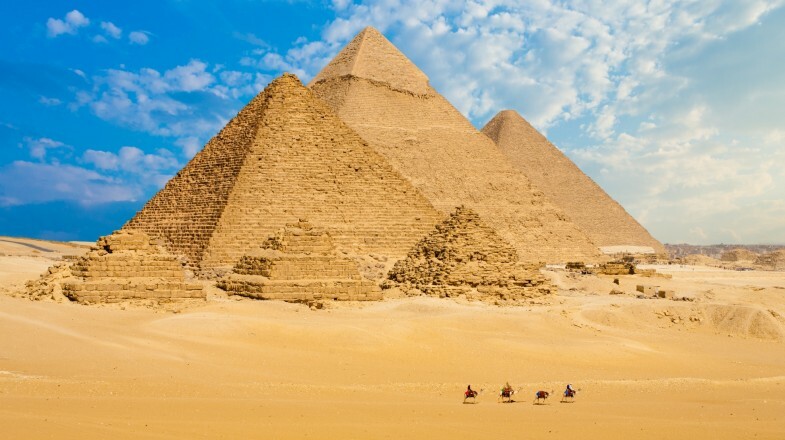 Home to some of the world’s most recognizable historical sites, enchanting bazaars and hundreds of laid-back shisha bars, a visit to Cairo is an absolute must for all the adventurers, hedonists and ancient history buffs. Egyptian Museum, located in downtown Cairo, is home to over 100,000 artefacts dating from ancient Egypt. Giza Pyramid Complex, one of the world’s most magnificent architectural feats, lies 13 kilometers southwest of the Egyptian capital. Khan el-Khalili, one of the largest bazaars in the Middle East, is nestled at the heart of Islamic Cairo. It is perfect for picking up souvenirs for the folks back home and getting lost in its crowded corridors. gorgeous, mosaic-paved building from 1908. You might want to plan your trip to Cairo outside of Ramadan, as the holiday might affect opening hours of tourist sites. Some coffee shops, bars and restaurants are closed or refrain from serving alcohol during this time. The best season to visit Cairo is between November and March, when the temperatures are mild and the pollution isn’t as overbearing as it is in the summer. Make sure to unwind like a local in of one Cairo’s many cafés, where you can treat yourself to strong Turkish-style coffee or mint tea. The preferred methods of getting around in Cairo are the metro (which has three lines that meet in the center of the city) and taxis, which will happily take you to any area the metro doesn’t cover. If you want to try your hand at haggling, it’s best to do so in one of the old souks (markets). You should keep in mind that haggling in more upmarket and Western-style shops and department stores is not a usual site.